In previous posts, I’ve covered the planning and writing of my novel, as well as using early readers to develop and improve the book, and how important it is to hire an actual professional editor. Now, it’s time to talk about something that could make or break a book: the cover. I’m going to tell you right now, I designed my own cover. And I’m also going to tell you right now, this is something you might want to spend money on to have a professional do it. For all I know, a professional book cover designer would have thrown something at me that blew my socks off with awesomeness. 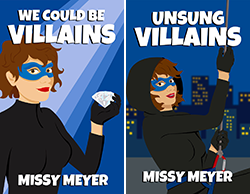 The problem with a lot of self-published book covers is that they’re bad. Some of them are really bad. If you want to see how bad they can be, just Google “bad self-published book covers”. There are multiple Tumblrs dedicated to them. Click over to Google Images with the same search, and you’ll see some real doozies. Kindle (ebooks) and CreateSpace (print books) have cover creator programs and templates, but that’s how you end up with covers that are more boring than ugly─a rectangle with a photo in it, with title above and author name below. Personally, I think that self-pub covers are generally too busy. Too many images all crammed in together, or too many different fonts, or a mix of those two things. In my previous life as a graphic designer, I always preferred things to be simple and clean. When we finally buy a house, it’ll probably be mid-century modern. I didn’t have my cover idea right away. I knew that a mask would be involved somehow. So let’s take a look at some of the various ideas I came up with, and why I threw them out! This was the first idea I put together, from pictures I picked up off the internet. 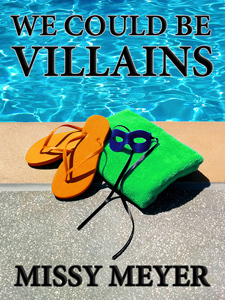 I wanted to combine the mask with something (in this case, sand and flip-flops and feet) that let the reader know that it wasn’t a super-serious superhero book. I needed something to lighten up the mask. Yeah, I know. Ugly. Amateur. Unusable. TYPICAL self-pub cover, with a terrible font and a crappy picture. But we must break some eggs before the omelet can be made. 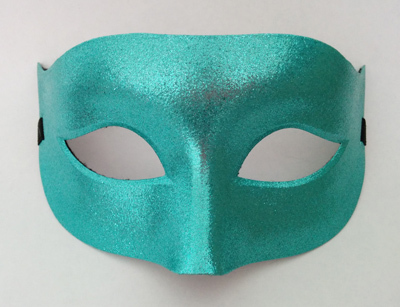 The mask I bought was too small, and I didn’t like the color. So I started looking at stock photo websites, to see if there was a picture of a mask that I could just buy and use. I built some mock-ups with a variety of stock photo masks. 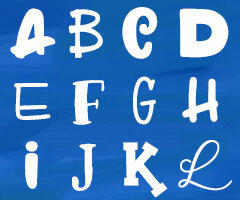 I also, in poking around, finally found the font I wanted to use. It gave just the right light feeling, which meant that the beach / feet / flip-flop thing might not be necessary. Which was great, because that also took me more toward the clean and simple thing I liked. I’ll throw in here another idea I had. I mocked it up and then discarded it immediately. I think the discarding part was a good decision. I took a bunch of pictures, monkeyed around in Photoshop, and was generally happy that I wouldn’t have to license someone else’s photograph. 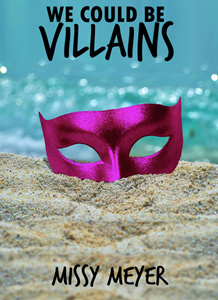 I mocked up a cover with beach and sand and stuff, just because that was my original idea, dammit, and I wouldn’t have been able to rest until I did. I got that beach photo online; I’ll just throw out here right now that mooching photos from Google is just fine for mocking things up to see if they work, but if you’re going to use them for realsies, you gotta pay for them. I was willing and ready to pay for a stock photo of a mask, until I found my own that I could photograph to my heart’s content. When I accidentally tripped and fell into my cover. 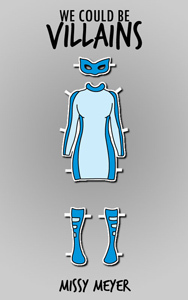 I placed the mask artwork on the page, and it was way larger than the page, so I resized it down a bit. It was as I was resizing that it just happened to sit there on the top half of the page, and I realized, hey, the title doesn’t need to be in black on the white space above the mask. It can be in white on the mask itself! So there you have it, the four-month-long journey of finding my book cover. Of course, if I’d paid a professional a couple hundred bucks, I could have saved myself all of this heartache. But on the flip side, the artist in me would have nagged me forever if I’d let someone else do my art. Next up: armed with a manuscript and a cover, time for the most irritating thing of all: laying out the book for Kindle and print. 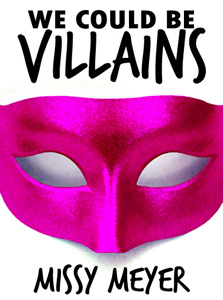 Check out my new novel, We Could Be Villains! I’m finding this really interesting and useful. I like your practical approach, a lot of this kind of advice is hand-waving about mindsets and attitudes, not very helpful. Thanks! Hope your book sells lots of copies! I actually really like the paper doll concept, but I think the real cover is more striking so I see why you went with that. 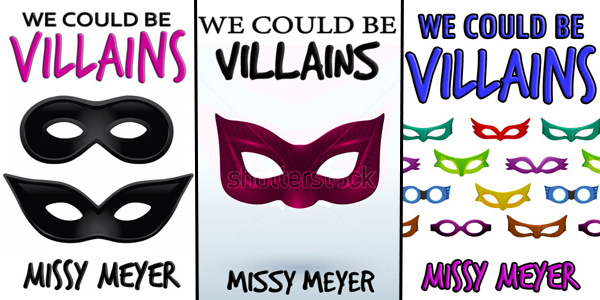 Hi Missy, I just wanted to say that I LOVED your book! I left a glowing review on Amazon (UK), but wanted to tell you directly as well. Are you going to write a follow up? I’d love to hear about how the job goes, and the last chapter teaser was very tantalising!